Blurb Description: Mare Barrow’s blood is red—the color of common folk—but her Silver ability, the power to control lightning, has turned her into a weapon that the royal court tries to control. I want you to think about the worst possible way a good book you’ve read has affected you. I want you to try and feel what you felt during your worst book hangover. Now, I’m going to tell you mine. As I read my way through the last day of the term before Winter Break, I managed to finish the heart breaking, soul ripping, mind twisting work of fiction titled Glass Sword. As I looked up at my best friend, who was sitting in my room, I had this expression of bewilderment on my face – like I couldn’t place where I was. Because for me, and even in my dreams later that night, I was no longer living in Chennai, India, but in Norta – with Mare Barrow. No, as Mare Barrow, the lightning girl, the Red Queen. If you don’t get it yet, reading Victoria Aveyard’s Glass Sword made me dream or rather, create, my own, albeit distorted, version of a rebellion, IN MY HEAD. 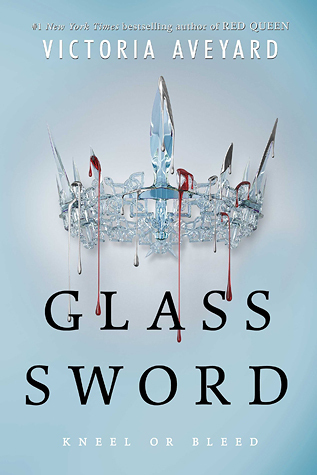 Victoria Aveyard’s Glass Sword had me recreating everything I’d just read and felt, but only this time, visually in my head. 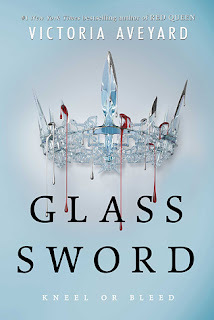 Victoria Aveyard’s Glass Sword made me truly believe that I was living in a world where I had to fight with weapons and wit, where anyone can betray anyone and one where I could either Kneel or Bleed. Victoria Aveyard, I salute you. And I thank you, for that brilliant experience. When I opened the book for the first time, I found myself back at exactly where I put it down – six months ago in my world, but just a few hours later in Mare’s. I was quite literally back on the train that Mare woke up to find herself in – with Cal, Kilorn, Farley and all the other members of the Scarlet Guard. Nothing had changed, but me, finally returning after what seems like a VERY long and rather tiring game of involuntarily hitting the snooze button. On the run from unmentionable things, because if you haven’t read Red Queen, then I’m not going to be the one to ruin it for you, Mare finds herself seeing the Scarlet Guard for what it really is, but more importantly, trying to figure who she is, and who she has to be. Mare Barrow or Mareena or the unforgiveable lightning girl? Something deadly and alone, or someone weak and defeated? Because Mare Is Red, and Silver, but stronger than both – and she’s not the only one. She has a list. A whole list of people just like her, all of whom are on top of the King’s hit list. And if she wants to stand a chance against him; if she wants change for the Reds and fairness to all, she has to find them. First. But the Silver King and his leash holder are forces to be reckoned with, and Mare is just one girl. Mare is a Glass Sword, and one that’s beginning to crack. Needless to say, I LOVED Glass Sword, and everything it had to offer me. I’m going to be crying for a year until I receive book three, but put in your orders, because this is not a book you want to miss.